Today early in the morning our driver will pick you from your hotel in Fes and we cross the Atlas Mountains, to reach Azrou and nearby cedar forest. Then we drive to Midelt , famous for its minerals and apples. We continue passing Ziz valley to reach city of Erfoud, famous for its fossil products. once we rich Merzouga fresh mint-tea will be awaiting for us for the hospitality, afterwords we will get ready for our camel ride to the desert camp where we will spend the night. Today we cross the Atlas Mountains, to reach Azrou and nearby cedar forest. Then we drive to Midelt , famous for its minerals and apples. We continue passing Ziz valley to reach city of Erfoud, famous for its fossil products. Then we drive to Rissani to visit local souk and later today we reach Merzouga desert. We stay overnight in local desert hotel with dinner and breakfast. Today we explore Merzouga desert. We will also visit village of Khamlia, famous for musicians originally from Sudan and Mali. We will have lunch with Berber family living in desert and later today we prepare for camel ride in Sahara desert, guided by experienced camel guide. 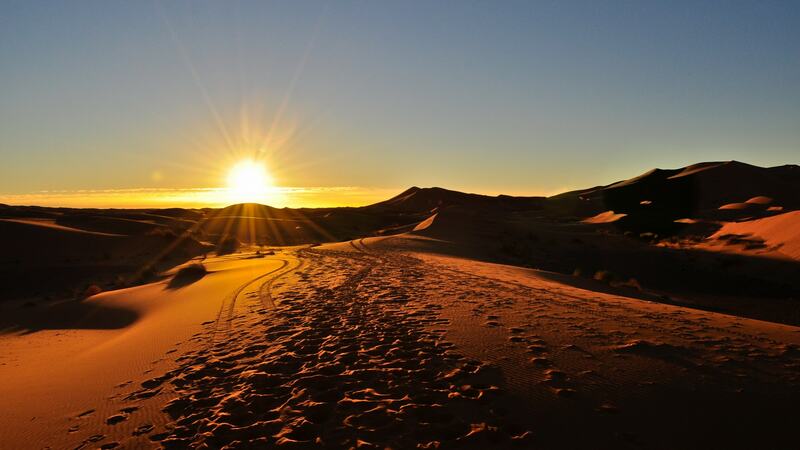 We will watch desert sunset in Merzouga desert. Once we reach desert camp we will enjoy Berber dinner, drum music at campfire in Merzouga. Overnight in tents in desert Merzouga. Our private Morocco tour continues today and we ride camels back from Merzouga desert camp to village. After breakfast we drive towards Rissani to visit local souk, then to Todra Gorges. Here we will walk in narrow canyon we experience hiking. Later we continue to Dades Gorges where we stay overnight in local hotel with dinner and breakfast. That will be the end of our services. This private Morocco tour can be modified depends on your requirements.